Linear drains 500 mm are the shortest wet room linear drain units available in our store. Equipped with necessary parts to fit our linear shower drains are also easy to clean and can be fitted almost anywhere in the shower: in the middle of the floor, against the wall or at the entrance. They are available in 8 lengths, from 500 to 1200 mm, allowing to turn both small and big spaces into fancy, super-stylish and perfect for creating a contemporary look. The SIEME linear drains are a series of elegant and durable, high-quality drainage systems. They are finished with an elegant frame and stainless steel grate with a width of 70 mm. The drains come in length of 500 mm. The product can be customized to match individual needs and tastes of the customers. The Stone drain is a very convenient and elegant solution. The grate is filled with tiles, making it fit neatly into any bathroom interior. The drain is also equipped with a stainless steel flange, useful for installation in the floor with an insulating layer. The set also includes adjustable legs and an insulating cuff. is the most popular linear drainage type. Length of 500 mm gives a lot of flexibility with installation and design of your wet room. It is made of 304 stainless steel which offers good corrosion resistance to both chemical and atmospheric exposures, with a high resistance to oxidation. It is surrounded by 30 mm wide steel flange and sealing membrane which are very useful especially in timber floors, although drain is also suitable for concrete flooring. This is perfect gully for tiled floors, as the lip height is 15 mm. Premium drain channel is 84 mm wide, while it comes with included Pure tile able grate, which is 12 mm deep and 64 mm wide, grate is 494 mm long and total drain length with insulation flange is 560 mm. Slot drain should be filled with tiles, so at the end of the day only visible part of the drain should be the channel which water flows through. Sealing membrane is a blue non-woven fabric which bonds well in the glue and is resistant to cracking. 65 mm high McAlpine siphon trap with pipe is also included to drain. It features capacity of 26 l /min and water seal 20 mm high. Trap can be opened from above, even after the installation is completed, after lifting up the grate to allow easy cleaning. Standard 1.5'' pipe is in the same pack, allowing instant connection to your waste system. Premium drain channel is 84 mm wide, while it comes with included Pure tile able grate, which is 12 mm deep and 64 mm wide, grate is 494 mm long and total drain length with insulation flange is 560 mm. Sealing membrane is a blue non-woven fabric which bonds well in the glue and is resistant to cracking. Premium drain channel is 84 mm wide, while it comes with included Zonda grate hole pattern, which is a row of rectangles set diagonally across the entire cover length, it is 64 mm wide, grate is 494 mm long and total drain length with insulation flange is 560 mm. Sealing membrane is a blue non-woven fabric which bonds well in the glue and is resistant to cracking. Premium drain channel is 84 mm wide, while it comes with included Mistral grating, which features a pattern of regularly placed circles of various size along the entire part length, 64 mm width, grate is 494 mm long and total drain length with insulation flange is 560 mm. Sealing membrane is a blue non-woven fabric which bonds well in the glue and is resistant to cracking. 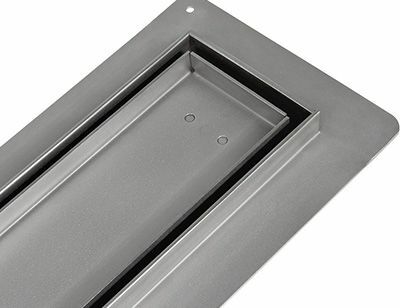 Premium drain channel is 84 mm wide, while it comes with included Tivano suitable cover, with pattern of regurarly placed L-shaped rectangles with a square inside from beginning to end of the grate, it is 64 mm wide, grate is 494 mm long and total drain length with insulation flange is 560mm. Sealing membrane is a blue non-woven fabric which bonds well in the glue and is resistant to cracking. Premium drain channel is 84 mm wide, while it comes with included Sirocco which is considered to be the most practical pattern, with 3 rows of square shaped holes running parallelly to cover edge and 64 mm wide, grate is 494 mm long and total drain length with insulation flange is 560mm. Sealing membrane is a blue non-woven fabric which bonds well in the glue and is resistant to cracking. is stainless steel drainage without insulating flange. It is recommended to be installed outside, or where the waterproof seal is not necessary. Swimming pools, terraces or garages are good examples of places where this drain can be fitted into. Manufactured of 304 stainless steel gives the product strength and corrosion resistance. It is not suitable for wooden floors, although can be cast into concrete screeded floor. Channel is 30 mm high and total height with waste trap is 98 mm. It's the cheapest linear shower drain in our store.8 mm. It's the cheapest linear shower drain in our store. 65 mm high Mc Alpine siphon trap with pipe is also included to drain. It features capacity of 26 l /min and water seal 20 mm high. Trap can be opened from above, even after the installation is completed, after lifting up the grate to allow easy cleaning. Standard 1.5'' pipe is in the same pack, allowing instant connection to your waste system. Width of Classic drainage channel is 8 cm and it has included Zonda grate hole pattern, which is a row of rectangles set diagonally across the entire cover length, it is 64 mm wide, grate is 494 mm long. During installation, you need to create support below the entire channel and you can set the height it protrudes above the floor surface. It allows you to adjust the lip height to match your tiles thickness. To ensure the drain works properly, surrounding area should be sound and tanked. Width of Classic drainage channel is 8 cm and it has included Mistral grating, which features a pattern of regularly placed circles of various size along the entire part length, 64 mm width, grate is 494 mm long. During installation, you need to create support below the entire channel and you can set the height it protrudes above the floor surface. It allows you to adjust the lip height to match your tiles thickness. To ensure the drain works properly, surrounding area should be sound and tanked. Width of Classic drainage channel is 8 cm and it has included Tivano suitable cover, with pattern of regurarly placed L-shaped rectangles with a square inside from beginning to end of the grate, it is 64 mm wide, grate is 494 mm long. During installation, you need to create support below the entire channel and you can set the height it protrudes above the floor surface. It allows you to adjust the lip height to match your tiles thickness. To ensure the drain works properly, surrounding area should be sound and tanked. Chat started. Session ID: 1556251537. You are now connected to: David M.